Rare opportunity for a ranch with contemporary style in Bloomfield's Vernor Estates! 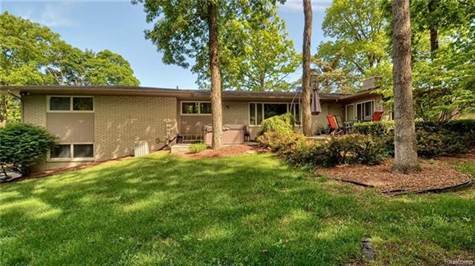 Situated on a private wooded lot of over half an acre on a quiet, low traffic street. Generous foyer with vaulted ceiling to welcome guests. Remodeled kitchen with maple cabinets, granite counters, island and premium Jenn Air apps, opens to family room with hardwoods, cathedral ceilings, natural fireplace and skylights. Living room features hardwood floors, a natural fireplace and picture window to enjoy private yard. Spacious formal dining room. All four bedrooms in the private wing with hardwood floors. Hall bath updated with granite vanity, jetted tub and Euro shower. Master suite with spacious private bath and walk in closet. Four season sun room off family room leads out to paver patio and hot tub. Finished walk out basement with rec room, newer full bath, spacious laundry and good storage. Fantasic location in Bloomfield with Way Elem-BH Middle-Bloomfield Hills High!